Your Pie’s Peach Prosciutto Pie was named as one of American’s most innovative menu items by QSR Magazine in the Taste of Place division. The report mentioned, “Today, guests are demanding much more complex and creative menu items, and hundreds of eager competitors are clamoring to give those to them.” Your Pie’s contribution is an ode to Georgia and earned the brand a trip to the World Pizza Games in Parma, Italy, to compete against some of the world’s best pizza makers. 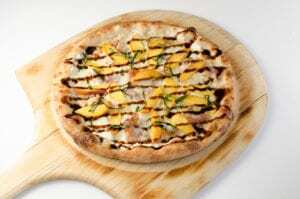 The pizza features peaches, a house-made balsamic reduction, prosciutto, and parmesan. Try the Peach Prosciutto Pizza in any Your Pie, through August 31st, 2017.